San Diego, CA—There are security interests and vital border concerns for Mexico and America. The solutions offered by both nations are intentionally a total farce. 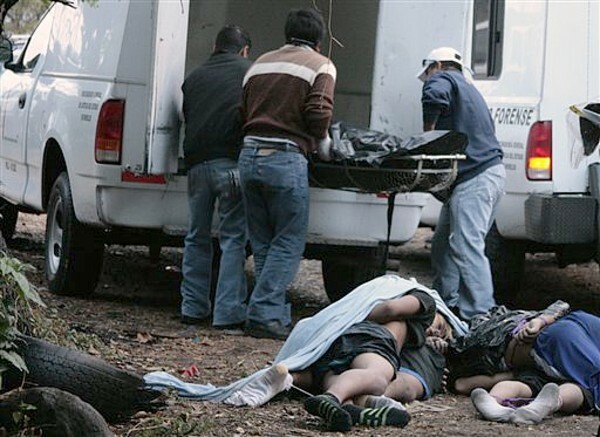 Mexico is awash with drugs, government corruption and incredible violence. The lucrative and insatiable illicit US drug market fuels it all. The United States can’t control the addicted or their spending habits. The open border, guarantees the free flow of narcotics along with the criminals that bring them here. Mexico’s officials have been whining that American gun rights, threatens their internal security. Thousands of weapons purchased by the Mexican government fall into the hands of their criminals. Add to it the efforts of the Obama administration to deliberately ship thousands of guns purchased from licensed American dealers to the same criminals and you have a massive mess. Any claim that either nation’s governments want to repair this disaster is pure hogwash. The cure is a simple one. Mexico and the US could cooperatively and tightly seal the border. Mexican criminals would be unable to deliver their drugs killing that illicit commerce. The flow of guns to Mexico would end but for the millions already stolen from the government over the last five decades. Mexico and the United States could solve their problems with simple border security. The truth is the massive political corruption of both nations will never allow the interruption of the drug trade. We have a Drug War simply to insure drug trade profits. Perhaps as much as a decade ago, I remember walking in to a big gun showin Phoenix and seeing what I presumed to be a young Hispanic man with a two-wheel cart on his way out. He was struggling with the obviously heavy cart and, as I passed by, I noticed it was burdened with eight cases of 7.62 ammunition, 1000 rounds per case. I'm a Bullseye pistol shooter and know some of the top talent who say they shoot about 1000 rounds per month. That's a lot and, without a commercial sponsor, they have to reload their own to be ablevto afford their sport. But 8000 rounds of AK-47 ammo isn't for sport. There's little doubt what country it went to. And while you don't see this done as blatantly today, it does seem clear that the border going in to Mexico is not the same one as the border coming into the US. We have no real border security.The USA has the most unsecured borders of any western nation. Border Patrol and ICE are not allowed to do their jobs. Imposter President oddbama has intentionally dragged his heels on Immigration Enforcement. The Mexican Illegals are only the Trojan Horse. Eventually, they will be replaced by MUSLIMS slipping in, then being given Citizenship, and Voting Rights, which will then lead to an Islamic conquering of America via the Ballot Box and other trickery by the current White House Administration.